We haven’t been formerly introduced yet, this lovely Chamaecyparis and I, but I think once we are, we will get along quite well. I never thought I cared much for Chamaecyparis, as a general rule, but I do like this one, and think it is a great addition to the garden. I probably wouldn’t have planted something like this on my own, so I’m glad the garden designer pushed me a little to think again about this genus of shrubs and give one or more a try. When the garden designer returns early next week to put the finishing touches on the front garden and start marking beds in the back garden, I’m sure she’ll make formal introductions including Genus, species, and variety. In the meantime, I’ll continue to keep it watered and get to know it better, along with other new plants in the garden. Good morning, Panicum virgatum 'Shenandoah'. Yes, the garden designer even convinced me to plant Panicum, switch grass. Oh Carol, you are a tease! Let's see the long shot! Chamaecyparis are lovely and the deer really like them in my garden. I doubt you will have that problem. Come on, show it all! Don't like Chamaecyparis, Carol? Glad you hired a designer! Japanese cypress is the "creme of the crop " when it comes to conifers and their price reflects it. Every garden I design has at least one or two. Your Chamaecyparis looks like "aurea" which has golden tipped needles. She's a beauty. I really like switchgrass, Northwind is the one I have, several plantings around the yard -stays up all winter. We planted pampas grass by the mailbox last fall. Grasses are easy, no fuss, and that's always a plus when gardening in Kansas. Oh, the False-cypresses I grew a dozen years ago in Illinois: Chamaecyparis nootkatensis variegata, Chamaecyparis pisifera 'Sungold', Chamaecyparis filifera 'Aurea Nana' and Chamaecyparis obtusa 'Densa'. On the other hand - in this zone I grow Magnolia, Michelia and Podocarpus so maybe it evens out. Happy week of gardening, Carol! You'll like the switchgrass! Shenandoah is in it's second season here and is looking great. You should look into 'North Wind' it's taller and more upright with nice green foliage. 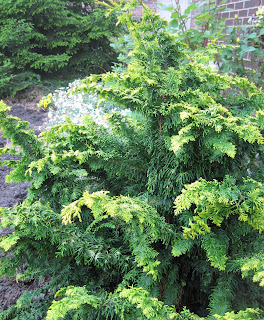 Chamaecyparis is a cool plant too - I wish I had one! Is that Chamaecyparis 'Fernspray Gold'? I just got one of those! I think it's really adorable. It's so exciting that things are taking shape! Oh, this is just so exciting! I can't wait to see more. I think it's nice to have someone force you see a garden through their eyes. I know I have been blind to a many number of plants until I see them used in a particular situation by someone who sees the beauty that I have missed. I'll be watching with interest to see how this lovely conifer grows. I would love to have something like this to plant on each side of the opening on our deck, but I believe these might grow to be too tall? A white Kerria???!!! I can't wait to see that. I have never seen one before. I like the evergreens. I think you will too. This one is a beauty. I am a recent fan of evergreens, after years of just perennials. If I had a next life, I'd come back as a garden designer. I hope that you will be posting pictures of your new front yard. I look forward to seeing it. I'm guessing that is 'Fern Spray Gold', but I could be wrong. A white Kerria? Oooooh! I've never cared for the Tang colored ones, but white might be pretty. It's nice to greet your plants and trees as they arrive- new kid on the block. So glad you chose switch grass! One of my very favorites. How exciting - already sounds like a fabulous plant list. I find all flavors of Chamaecyparis and Panicum irresistible. You're going to love them!